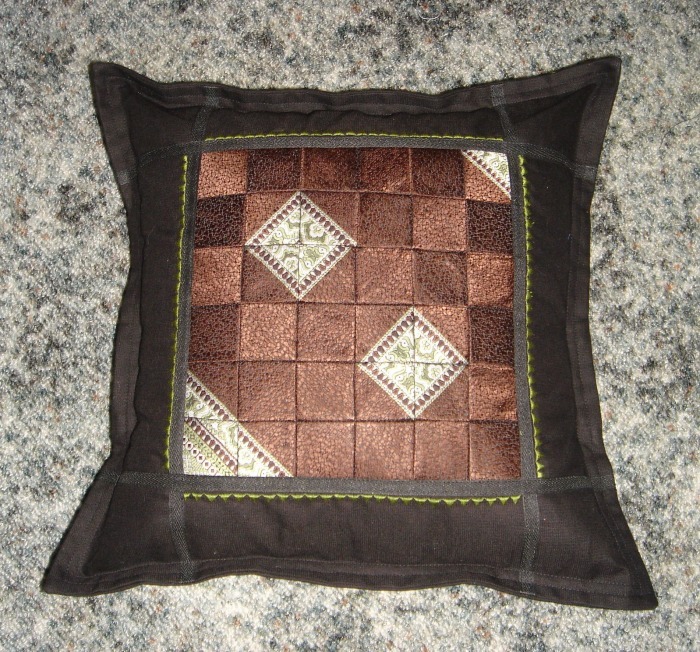 16" x 16" cushion made with one man's tie that was fussy cut and sewn back together to create a unique pattern. 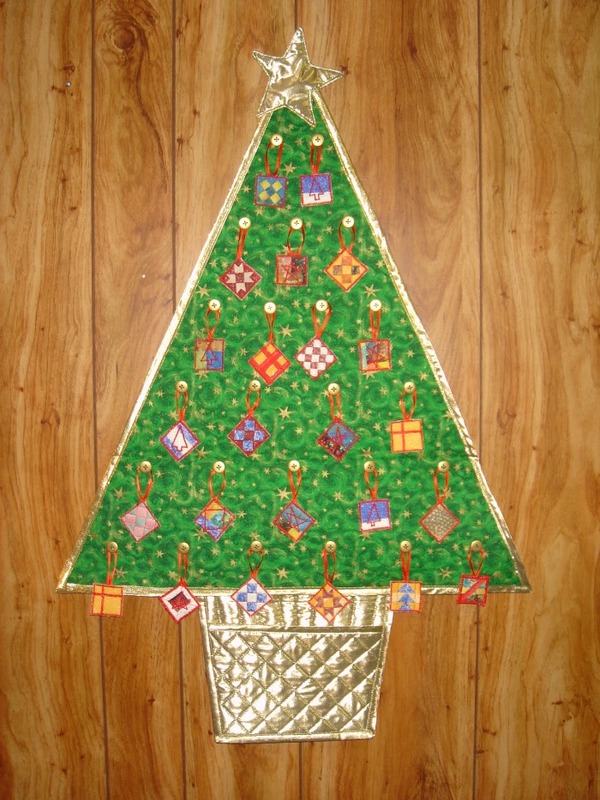 This is an advent tree. 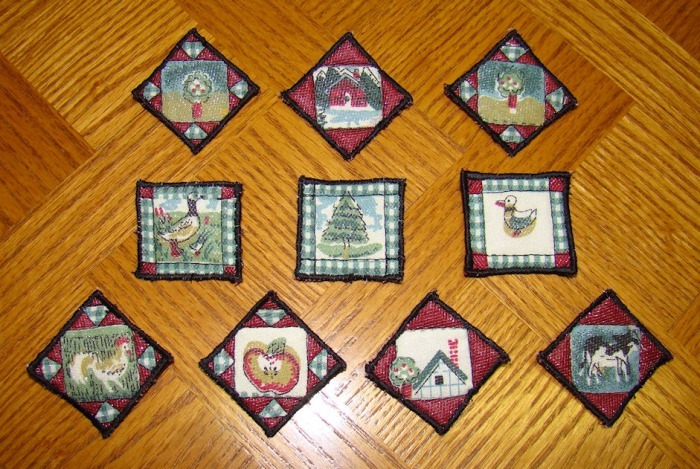 There are 24 buttons on which to hang one ornament every day. 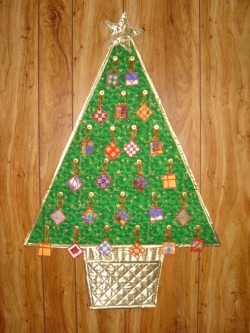 The ornaments store in the pocket (tree trunk) I made the tree for Nicole last year when she was living in residence. 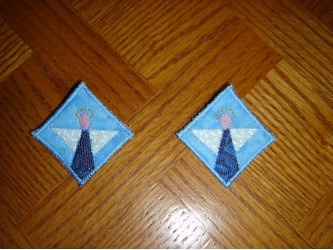 I also brought her 24 special ornaments that hung on our tree over the years. 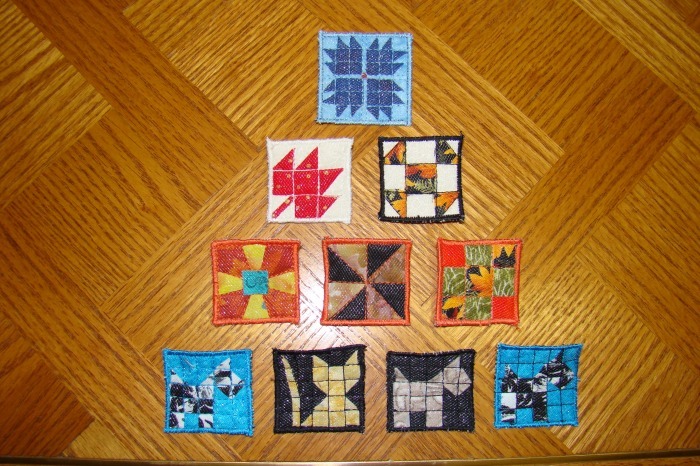 This year I made ornaments for the tree. 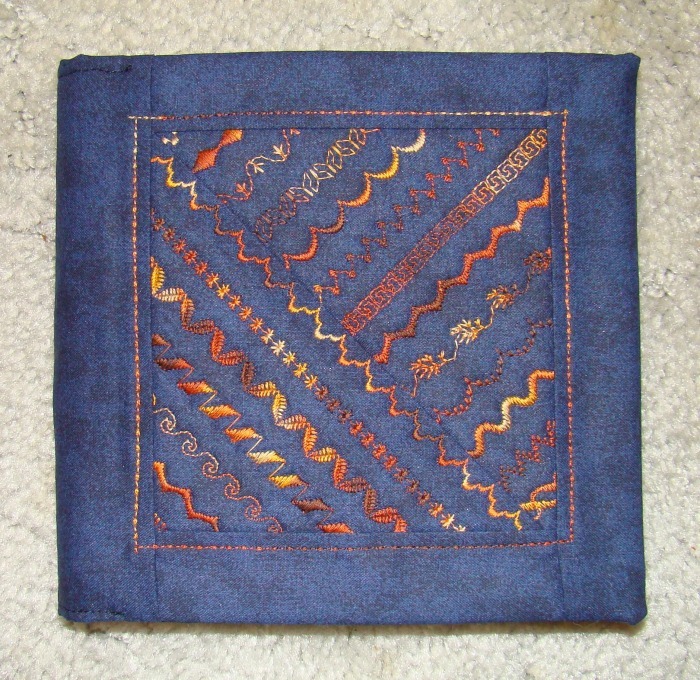 Blanket backed with denim. 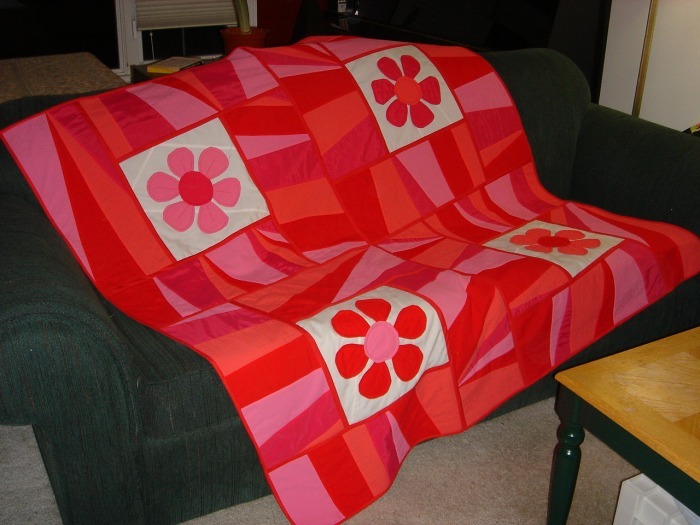 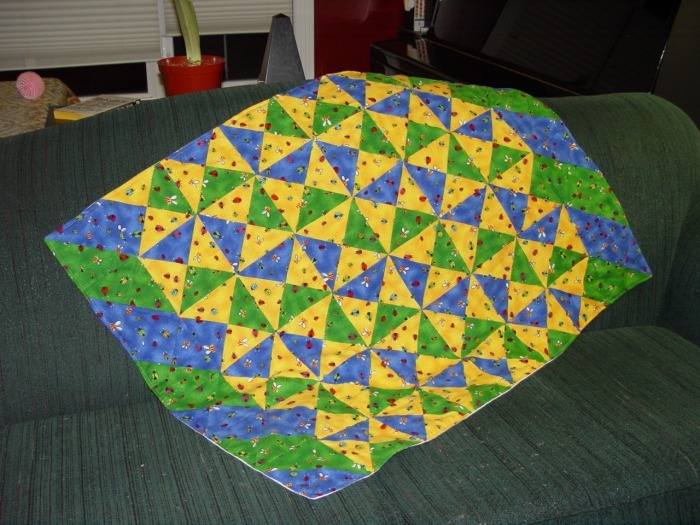 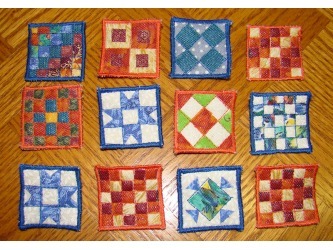 Quilt as you go method. 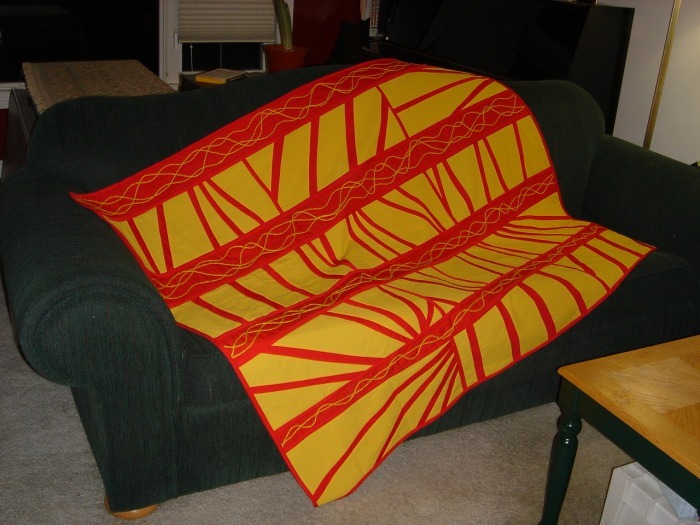 Yellow yarn couched to red fabric. 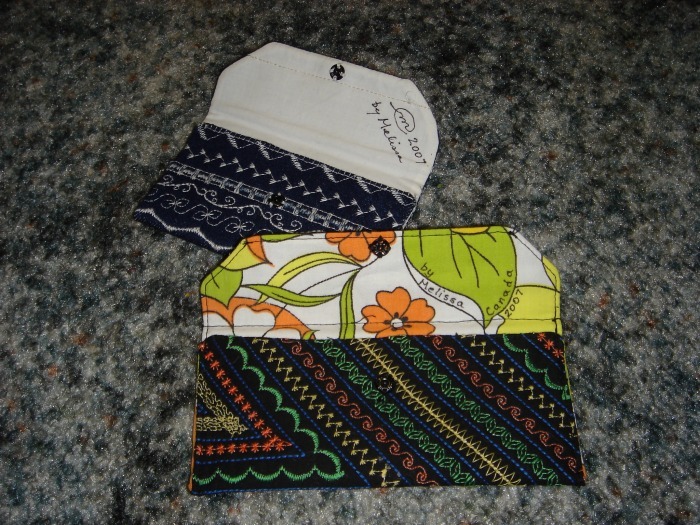 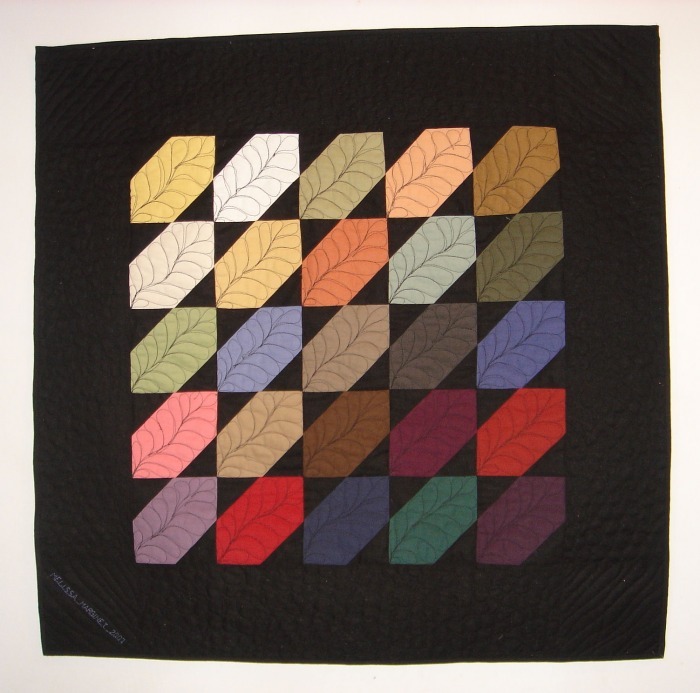 Pattern by Caryl Bryer Fallert. 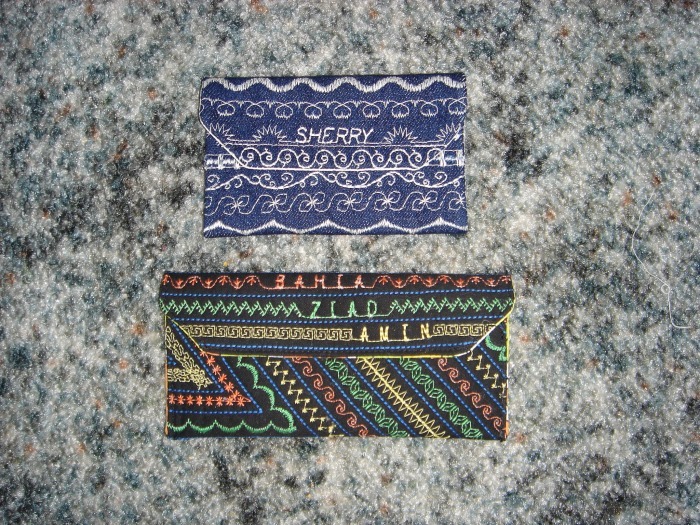 Made with drapery samples. 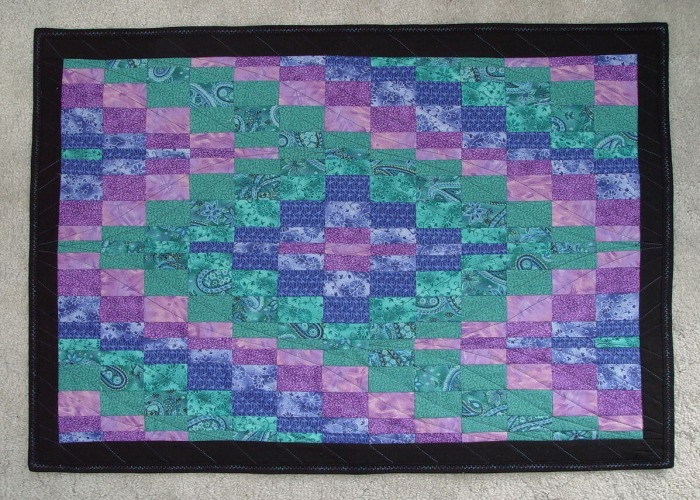 I bought the hanger and then designed the quilt to match the hanger. 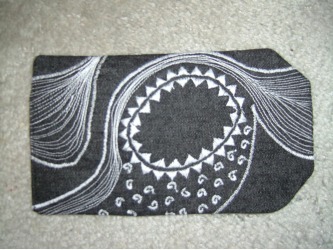 Wall hanging to match the cushion previously made for Nicole. 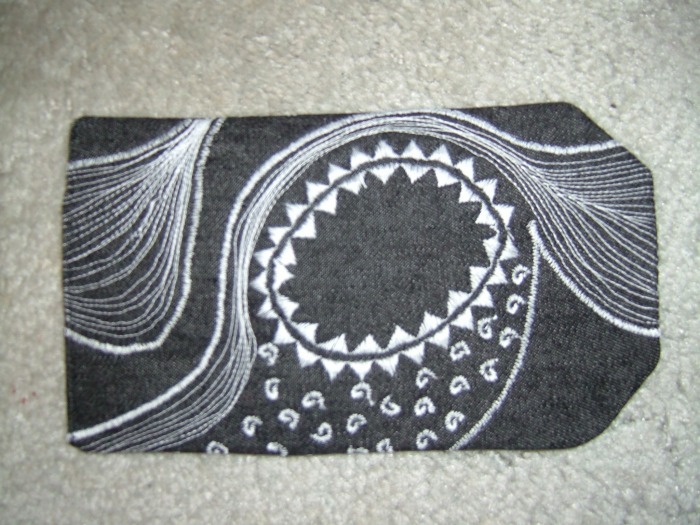 Using fancy stitches on my sewing machine. 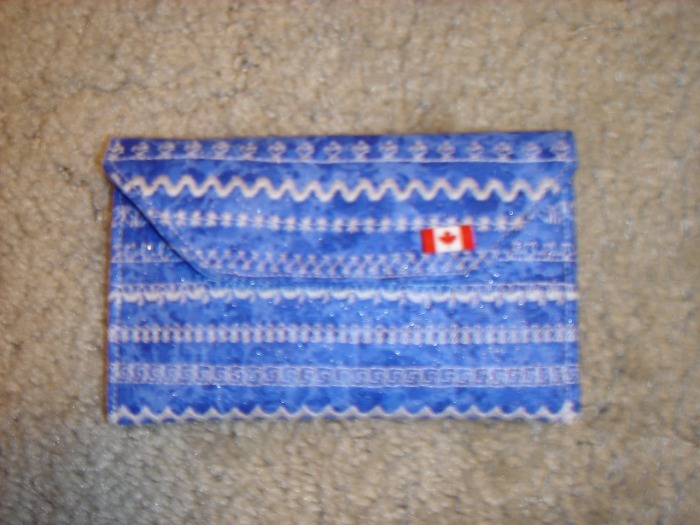 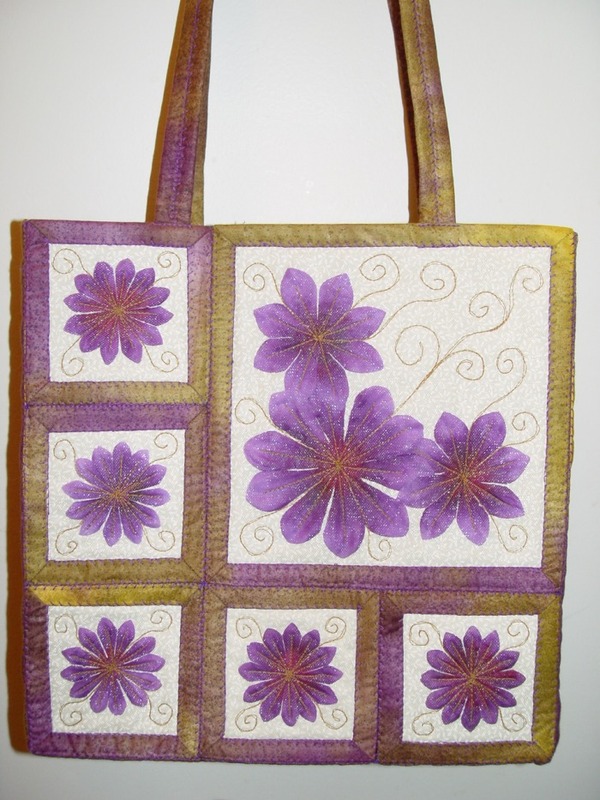 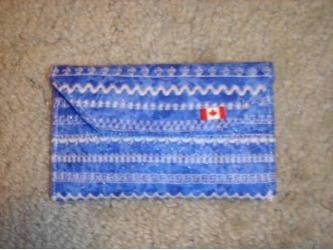 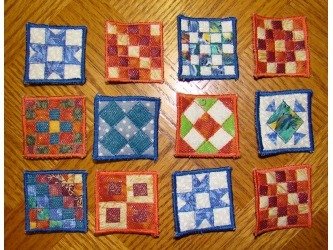 6 mini quilts sewn together make the front of this bag. 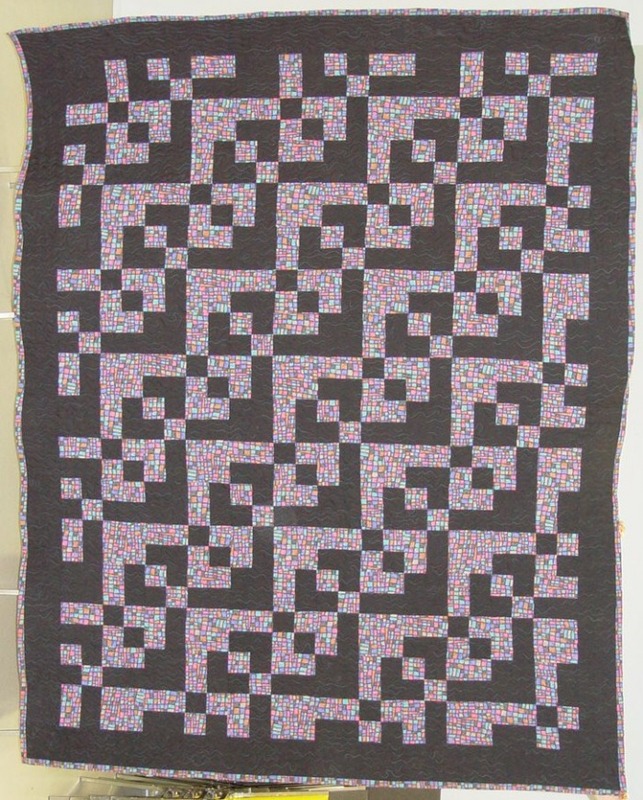 12' x 12" x 3"
Made at an MPQ class taught by Pat Findlay. 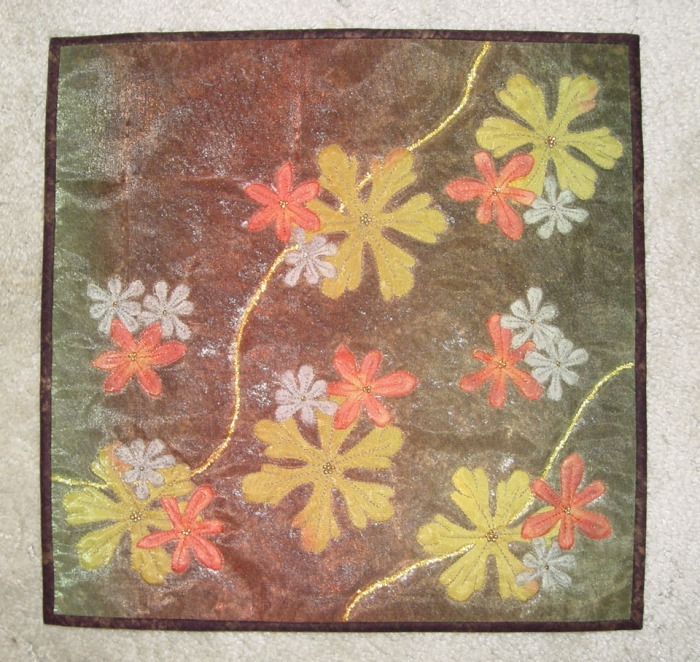 The silk flowers have organza laid overtop adn then it is quilted. 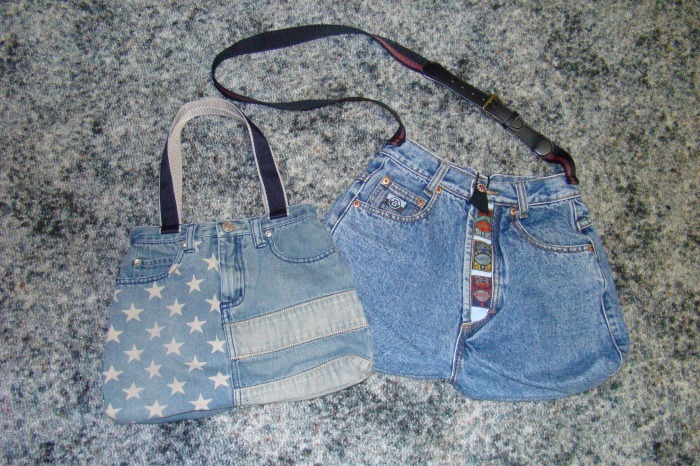 Doesn't photograph well. 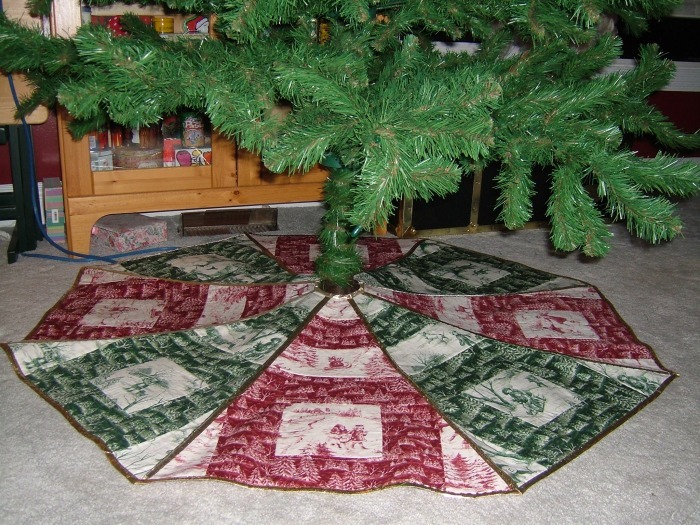 Tree skirt. 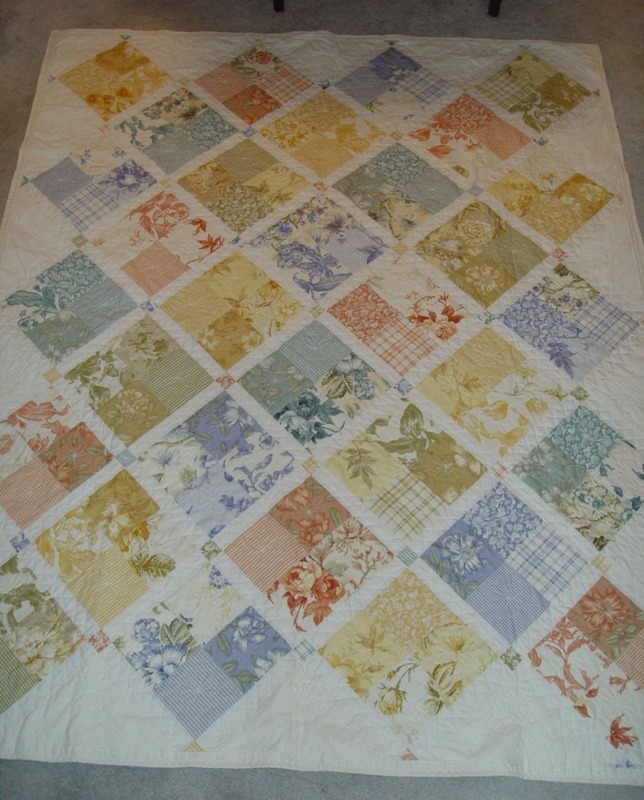 Centre square in each piece is a fussy cut scene from a toile fabric. 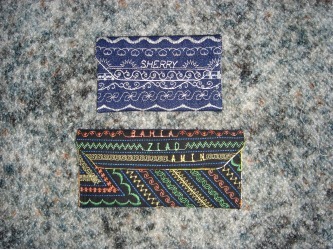 15 people exchanged 2 1/2 inch strips of blue fabric then we each set to work and this is what we came up with. 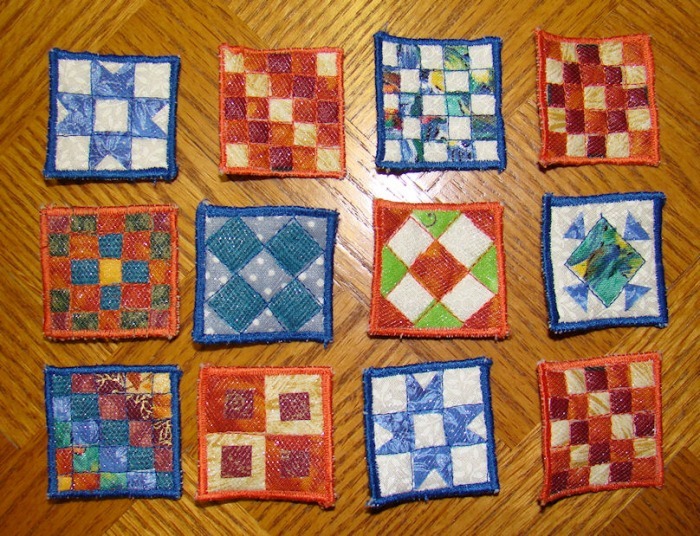 Made with the leftover strips from Flirtation bargello quilt. My own pattern. Made with off centre 9 patches. 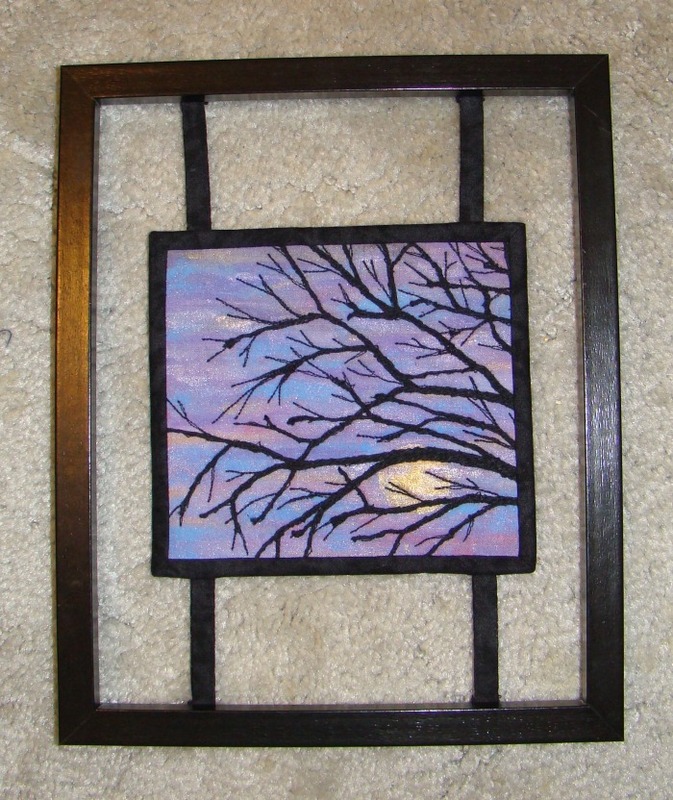 I hand painted the background then couched yarn and thread painted the tree. 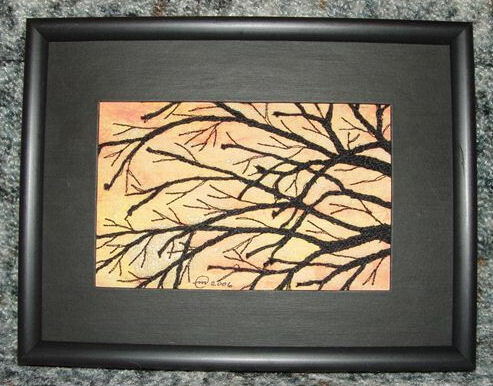 I took this one out of the brown frame (pictured below) and put it in a black frame to give to mom and dad for Christmas. 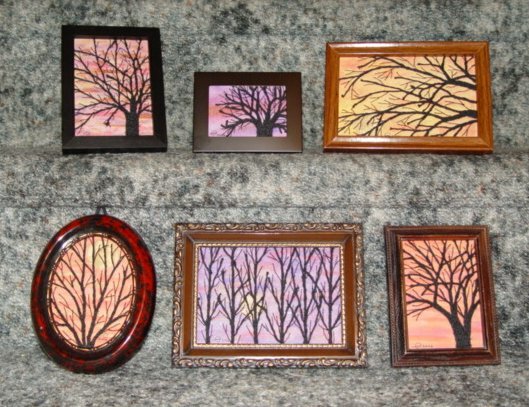 I hand painted the background then couched yarn and thread painted the trees. 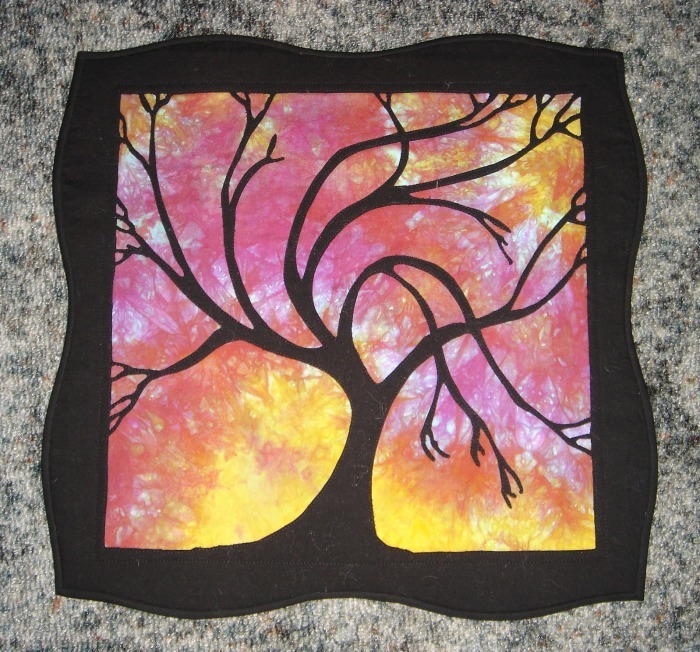 I hand painted the background then made the tree with couched yarn and thread painting. 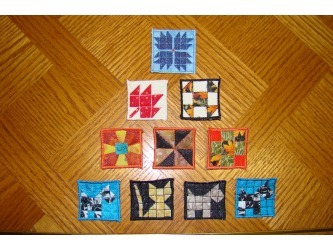 The 6" x 5.5" quilt is mounted in an 8" x 10" wooden picture frame. 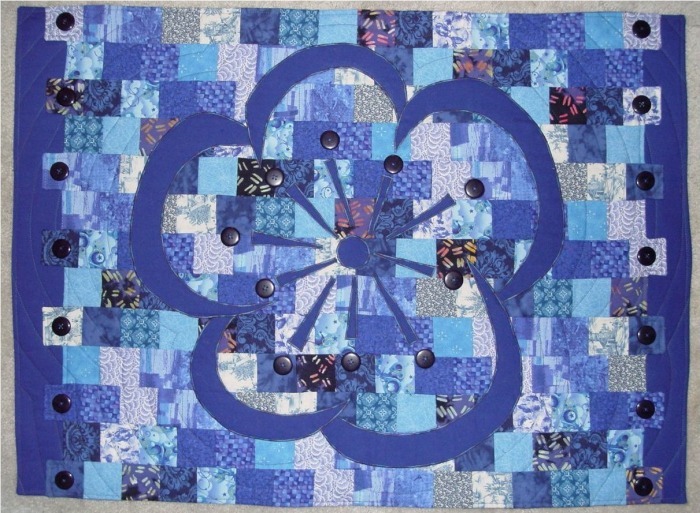 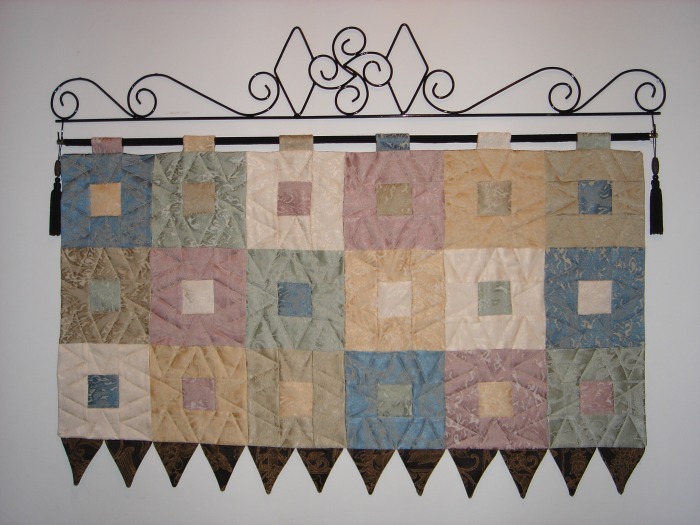 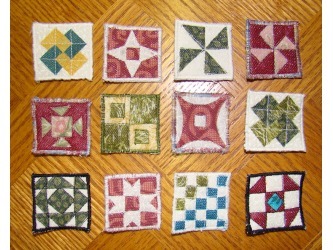 Reverse applique stained glass quilt. 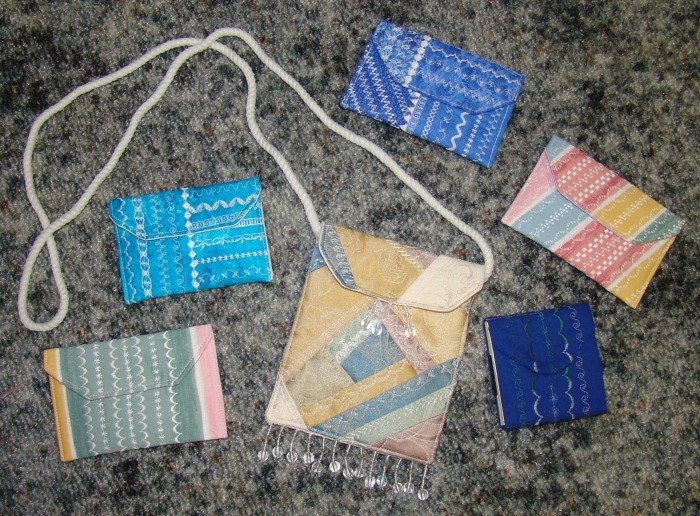 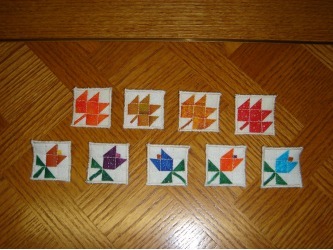 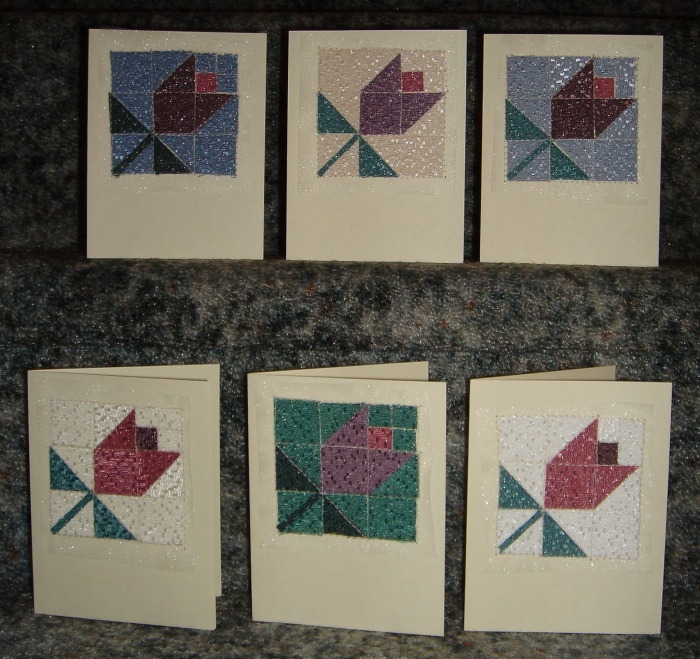 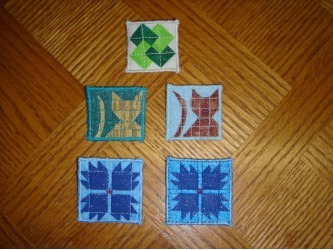 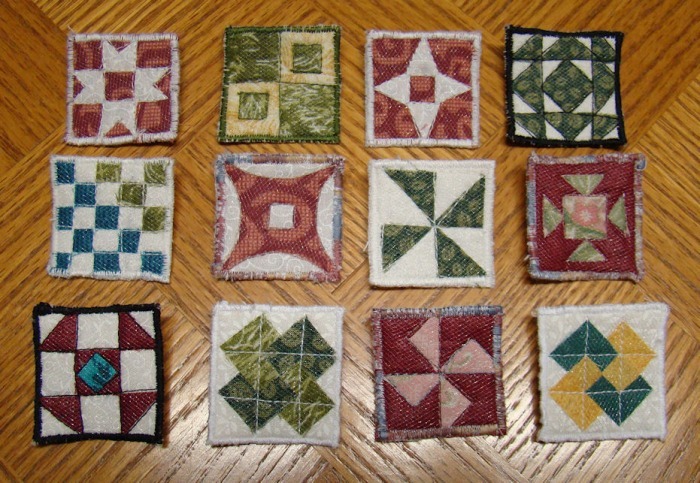 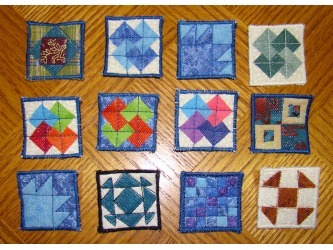 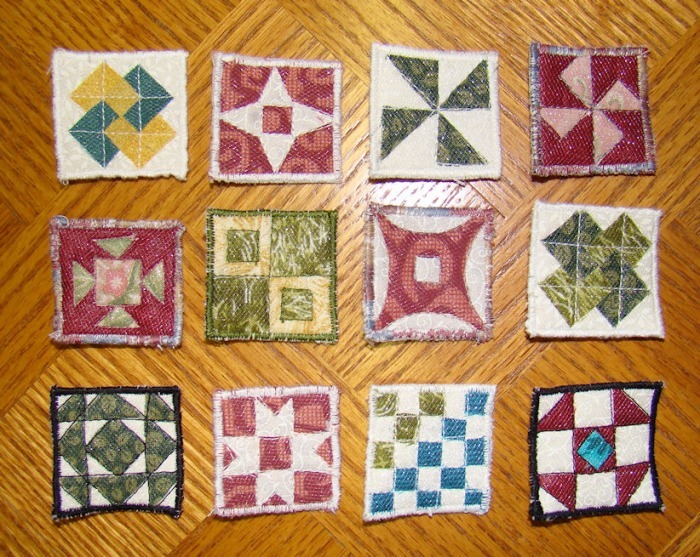 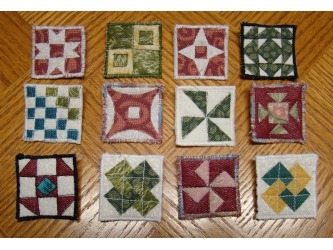 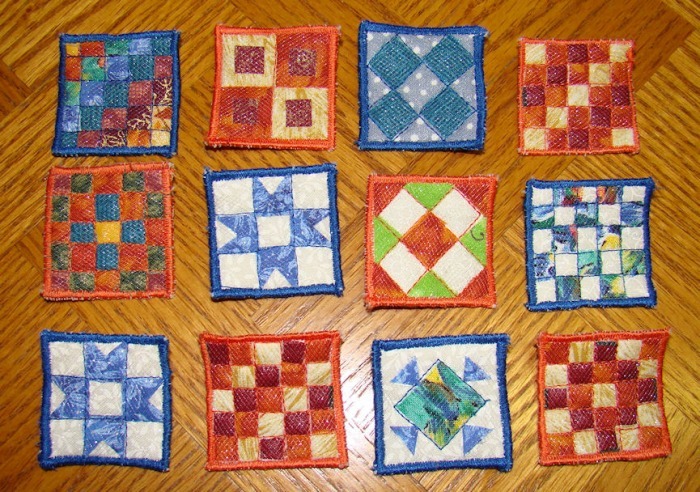 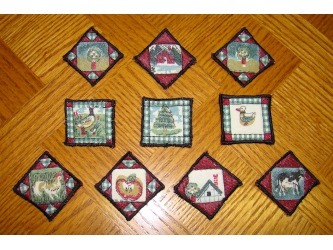 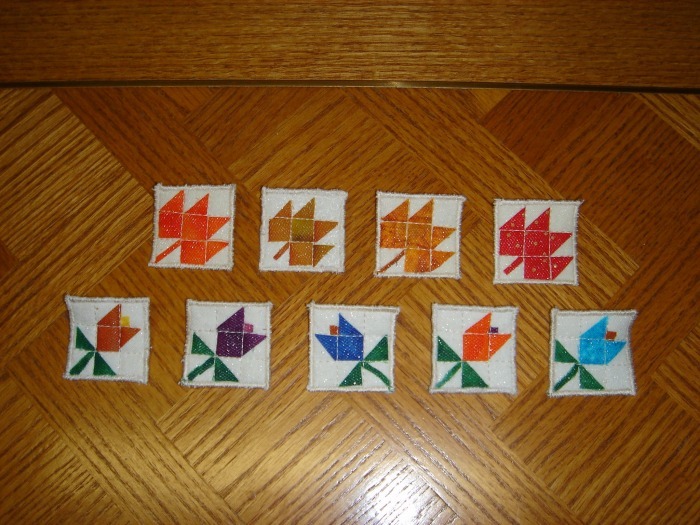 Each of these tiny quilts is 1.25" square. 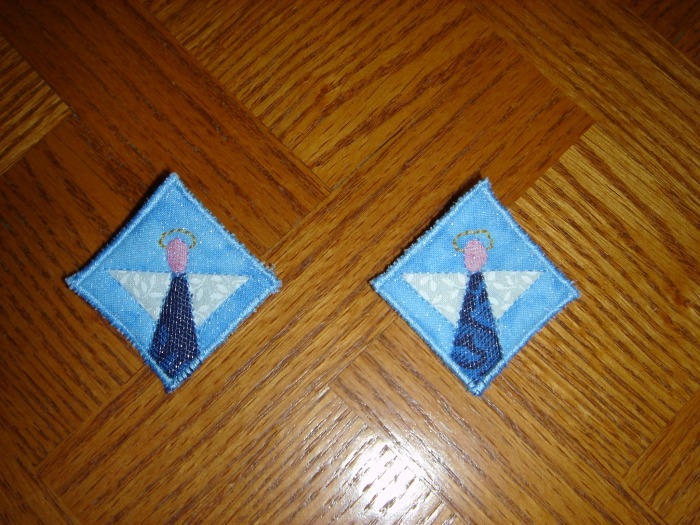 There is a pin on the back of each one. 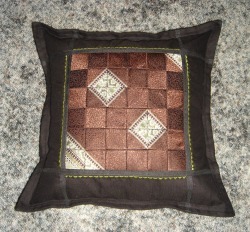 Upholstery fabric glued onto cardstock then covered with netting and stitched. 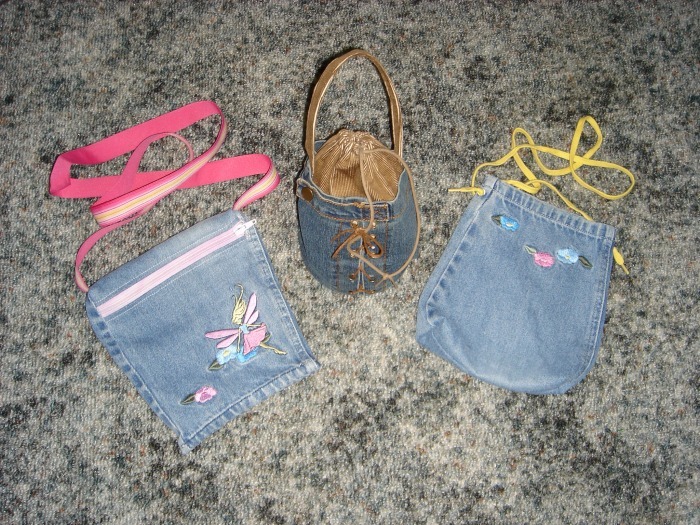 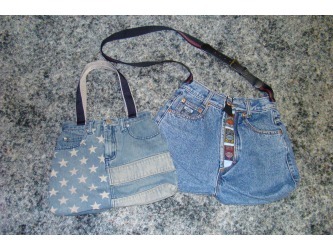 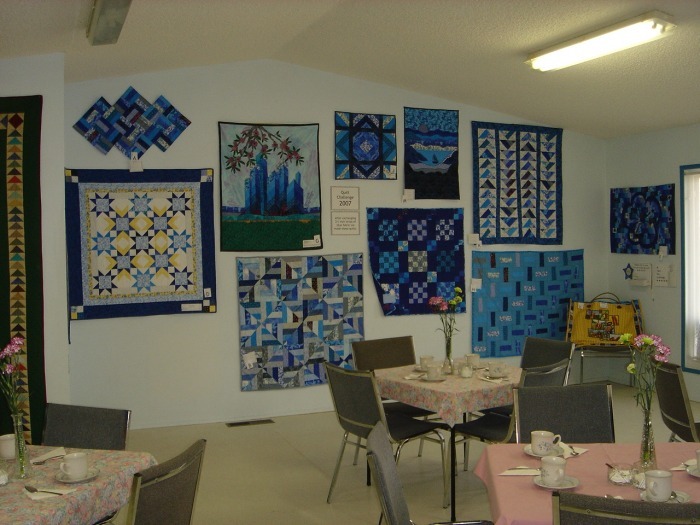 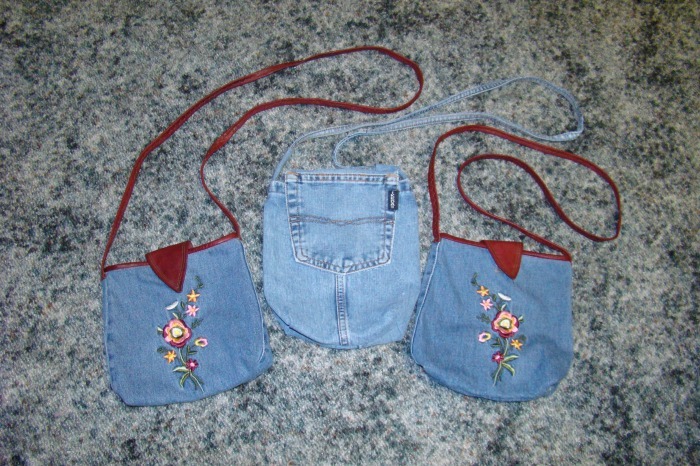 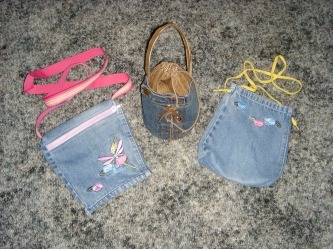 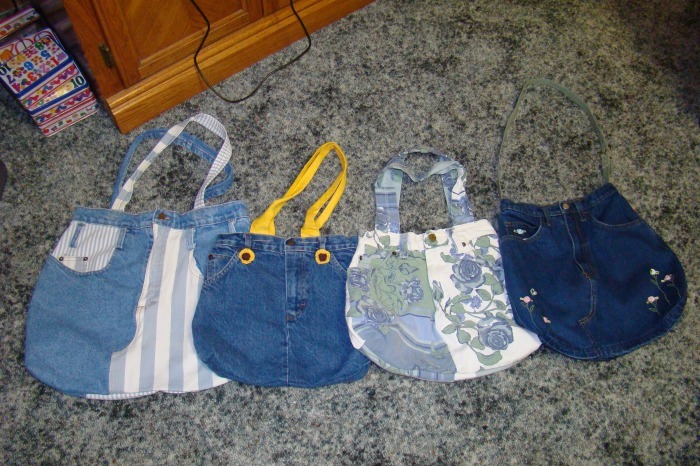 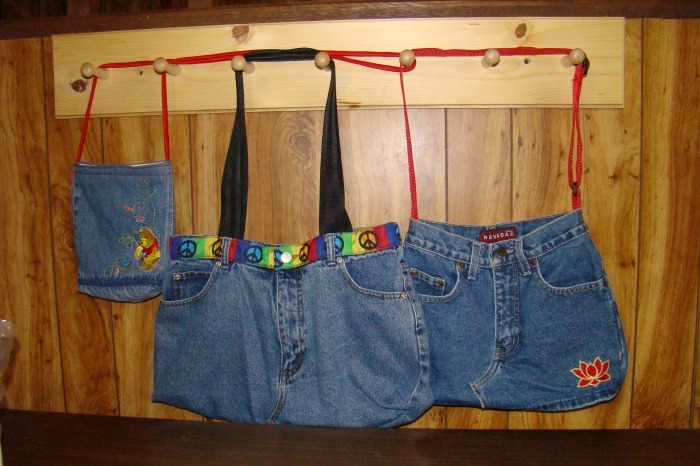 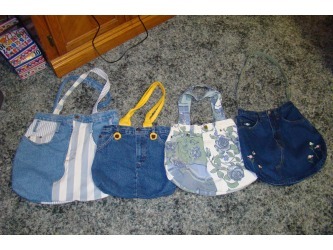 These are all made from blue jeans. 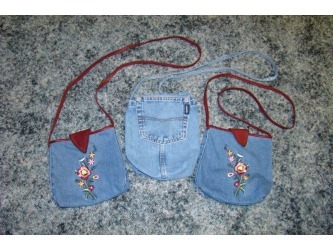 I like using jeans that have embroidery or other interesting detail. 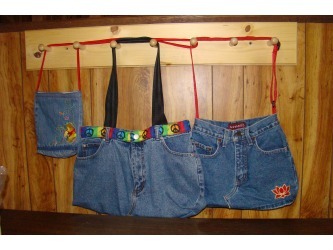 Many of the straps are belts or tote bag straps I pick up at second hand stores.